Unit is 69” wide x 53” deep x 175” tall. Modular 4” square x ¼” wall structural tube frame construction with continuous welds and tubular cross bracing. 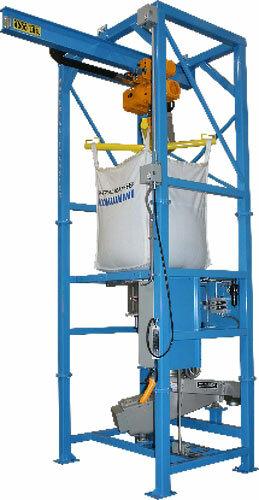 2-Ton Harrington hoist with motorized trolley, and Spider-Lift™ bulk bag lifting frame provides safe, efficient bag loading and unloading. Flo-Lock™ discharge gate quickly halts material flow for partial bag discharge. Seal-Master™ chamber features twin “gull wing” doors for optimal discharge spout access. Sure-Seal™ pneumatic spout clamping system seals the bag discharge spout for dust-tight product discharge. Unit includes a custom, 304-2b stainless steel product discharge transition. Unit features an Eriez vibratory feeder with screener and variable speed controls. Unit designed to feed 44-50 PCF porous alumina @ 370#/minute. NEMA 4 electrical enclosures and controls.